Another partner of Gdynia Modernism Route is located near the modernist Gliszczyński tenement house from 1938 at 41 Abrahama Street (the "Świętojańska" Route). We are talking about a photographer's shop called Foto Complex which has been in the building since 1994, however it can take pride in 26 years in the business. The shop's attraction is its extensive collection of cameras which are exhibited in glass cabinets. Leica, Exakta, Zorka, Yashica, Kiev, Ami, Brownie, Start, Druh and many more 35mm, medium format and large format cameras, single- and twin-lens reflex cameras, rangefinders and box cameras. Those who take part in the modernist city game will draw questions about prewar photography, will be given a unique chance to have a close look at the cameras and listen to stories about their history and the way they work. There also is a mini photo gallery in the shop. 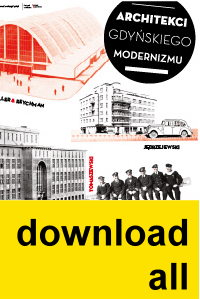 Currently they present photographs of modernist architecture of Gdynia taken by Przemek Kozłowski. Foto Complex runs a shop and a second-hand shop with photographic equipment, completes unusual orders in the field of photography and video filming, offers services connected with servicing analogue and digital cameras, both amateur and professional. They also repair lenses, flashguns, video cameras, slide projectors and film projectors as well as darkroom equipment.